We are pleased to offer Custom Built Drift Boat Trailers, Custom Made Drift Boat Trailer Rollers and other Custom Made Accessories. 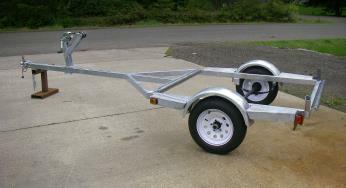 If you would like to build your own trailer rather than buy a factory built trailer. We can assist you with your design and design requirements. We offer one basic trailer design which can be modified to meet your individual requirements or to properly fit your boat. Our "Rollers" are custom built to fit your drift boat trailer and are designed for easy installation using any of our hanger designs. Rollers are made from 2-1/2" .125 wall 6061-T6 Aluminum Tube. Also available in 11ga. Steel Tube, 2" Rigid Conduit or 1-1/2" Intermediate Conduit and feature custom UHMW replaceable bushing style bearings. We also offer complete Light Kits in both incandescent and LED Lights, surface or recessed mounting. Either of which can also be designed into any of our trailer designs. A complete list of available accessories are listed on our products page and our accessories page. Check them out for detailed information and pricing information. For inquiries please use any of the "Contact Us" methods listed on each page.